Only graded assignments, graded discussions, graded quizzes, and graded surveys that have been published display in the Gradebook. Not Graded assignments are not included. The default view in the Gradebook is to view all students at a time, but you can also view students individually in the Gradebook Individual View. Note: If your course includes multiple graders, please note that once you open the Gradebook, all existing Gradebook data is stored in the browser until the page is refreshed. Grades are not dynamically updated with any changes made by other graders in the Gradebook or in SpeedGrader. The Gradebook has two views. The Default Gradebook allows you to see all students and assignments at the same time. Individual View allows instructors to assess one student and one assignment at a time and is fully accessible for screen readers. Both views retain the same Gradebook settings. You can switch Gradebook views at any time. 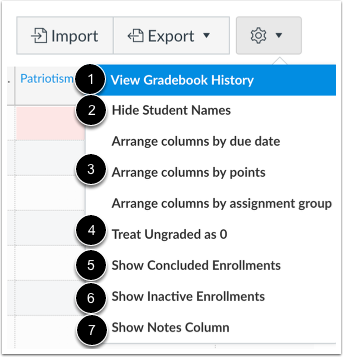 Learn more about the Gradebook Individual View. By default, your course shows all active students. If your course includes more than one section, you can filter your Gradebook by section . You can also search for a student by name or secondary ID . When a section filter is applied in the Gradebook, SpeedGrader also filters the student list by students in the same section. 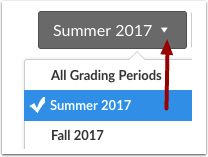 When Multiple Grading Periods are enabled in a course, you can sort the Gradebook by grading period by clicking the Grading Period drop-down menu. For student information, the Gradebook, displays each student's name and section . Names are sorted by first name last name, though you can also set your Gradebook to display via sortable name. 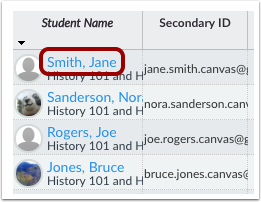 If a student includes a secondary ID, which is the student's login information, the ID displays in the Secondary ID field . If you enabled the Notes column in your Gradebook settings, you can add notes about individual students. Note: You can also hide student names in the Gradebook to eliminate bias. To sort columns, click the heading of a column and use the blue arrow to sort the content in ascending or descending order. 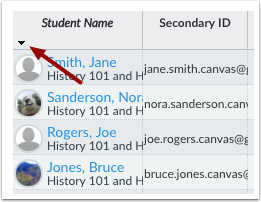 You can sort Student Name and Secondary ID columns. To view a student's Grades page, click the student's name. This page shows you how a student views his or her grades and also allows you to view individual comments, scoring details, and rubric results. If you have enabled Student View, the Test Student is shown at the end of the Gradebook and is automatically added to every section in your course. Test Student data does not factor into course analytics. If you want to remove the test student completely, you must remove the test student from your section enrollments. Each column in the Gradebook represents an assignment, graded discussion, or quiz. Each column displays the assignment title, total points, and each student's grade. Icons and colors represent assignments and submission statuses within Canvas. You can sort, resize, and reorder any assignment column. To remove a column from the Gradebook, you must delete the assignment from your course. 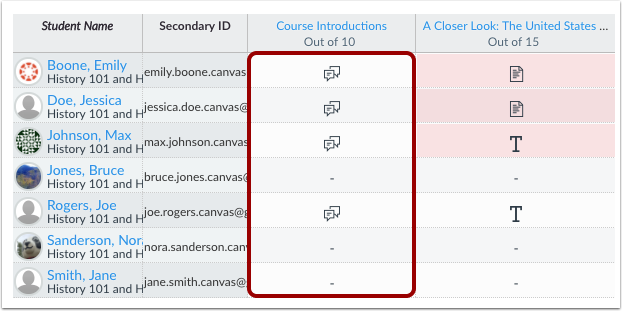 Assignment columns are automatically added every time you create and publish assignments, graded discussions, and graded quizzes and surveys. A column is also automatically added for the Attendance tool. You can also manually add a column by downloading the Gradebook CSV file, adding a new column, giving the column a title, and uploading the CSV file. Please be aware that assignments uploaded in CSV files are automatically published. 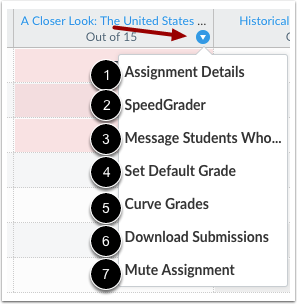 When using differentiated assignments, the assignment appears as a column for all students, but grade cells are grayed out for students who are not part of the assignment. Grades cannot be assigned to students who are not part of the assignment; those assignments are not factored into overall grades. Note: Differentiated assignments also apply to grading periods. If a student is not part of an assignment in the specific grading period, the assignment is also grayed out. The assignment groups shown in the Gradebook match the assignment groups created in the Assignments page. If your assignment groups are weighted, the weighted grade displays below the group title, and the assignment score earned by each student is multiplied by the weight. Grade totals are displayed in the Total column of the Gradebook. You can move the total column to the front of the Gradebook if preferred. Additionally, if your assignment groups are not weighted, you can view the totals as a point value instead of a percentage. Assignment group weights are reflected in the total grade. The assignment grade earned by the students is multiplied by the assignment group weight and is then reflected in the Total column. To bulk manage student grades in the Gradebook, you can also Download Scores (.csv) and Upload Scores (from .csv). Note: The Gradebook Export CSV file data matches the current filter(s) and settings shown in the Gradebook. Previous Topic:How do I log out of Canvas as an instructor? 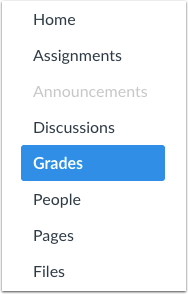 Next Topic:How do I view assignments or students individually in the Gradebook? Table of Contents > Grades > How do I use the Gradebook? How do I open an assignment or a quiz or test for a student to retake after the deadline for submission has passed? Does this happen in gradebook or some other place? Thanks for adding your questions. It depends on what you're trying to edit. Editing an assignment's due date for a student, must be done in Assignments. 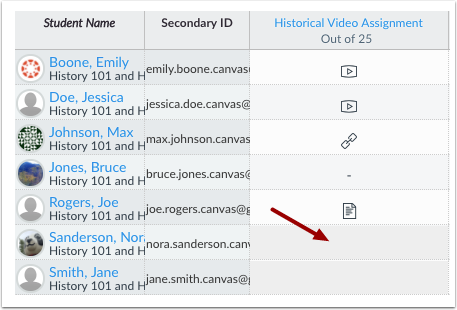 You'll edit the assignment and use the Assign To fields to assign a different due for a specific student. For more information, check out the How do I assign an assignment to an individual student? guide. To assign a different quiz due date for a student, you'll need to open Quizzes, edit the quiz and use the Assign To fields to assign a different due date for a specific student. See the How do I assign a quiz to an individual student? guide for more information. To allow a student multiple quiz attempts, check out the Once I publish a quiz, how can I give my students extra attempts? guide. It will walk you through how to give extra attempts to students who have and have not taken the quiz yet. If you have any other questions, please let us know. "When we work together, the possibilities are endless!" Re: How do I insert my discussions into weighted assignment groups? Re: How I can grade final exam? How to activate final exam (52 points)?